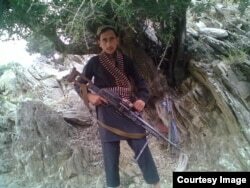 Recruited as a child soldier into Islamic State’s branch in Afghanistan and Pakistan, Lal Mohammed accompanied his elder teenage brother, Bakht e Ali and their father, Taweez Khan into the training and indoctrination for a promised life of religious glory. They lived for almost two years as members of the Wilayet e Khorasan, or Islamic State Khorasan Province, in Eastern Afghanistan. “I was nine years old when I was with them. Now I am 12. They used to show us videos on how to fight and carry out suicide bombings,” Mohammad said. His older brother was around 16 when he joined the militant group. Islamic State, known regionally as ISKP, emerged in the region in early 2015. Most originally belonged to the Pakistani Taliban, which had been displaced from their stronghold in Pakistan’s tribal areas by a military operation. Bakht e Ali, the older of the two brothers, who were both child soldiers trained by IS. Across the border in Afghanistan, 15 years of war had left vast swathes of territory without government. The age-old Pashtun tradition of welcoming guests helped them find shelter in the homes of local Shinwari tribesmen, who had been refugees during the Soviet invasion of Afghanistan in the 1980s and were eager to return the favor. Eastern Afghanistan, particularly Nangarhar province, became an IS stronghold. Later, many of those who provided shelter had to flee with their families, often leaving their belongings behind. The militants told the locals their police and army were puppets of infidels and they needed to rise up in jihad, a holy war. Some of the locals, like Khan and his sons, joined their ranks. Life with ISKP for the boys was regimented. They woke up before dawn to offer morning prayers, followed by religious lessons focused on jihad, then daily chores, and finally weapons training. Ali recalled around 100 to 150 kids who lived and trained with them, including some who were under 10 years old, like his brother, Mohammad. The two brothers learned to operate various kinds of weapons including AK 47s and rocket launchers. All the children's needs, clothing, weapons, food, were taken care of. Khan, their father, received a salary from ISKP. The two brothers remember their training to be very disciplined. The ultimate goal was to make them suicide bombers. One day, they took the younger brother on a mission. “Daesh fighters told me we were going to be in a firefight, and that they would stay behind and open fire from the check post. I should go forward and explode my suicide vest,” Mohammad said. ISKP lost that fight and had to retreat. He came back alive. The militants focused on molding young minds by showing videos and playing militant music to increase the boys' sense of affiliation with IS. The brothers said the idea of being part of something bigger than themselves, a battle between good and evil, felt good. Militants punished anyone who did not follow their fundamentalist brand of sharia. “We’ve seen torture. We’ve seen it happening to our own friends or relatives,” Ali recalled. He also recalled how normal it was to kill someone. Khan said, “Sometimes they would tie people’s hands and feet, and then slaughter them. Sometimes they would hang a man from a tree and just leave him there to die. Sometimes they would just beat someone up with batons 'til he died,” he said. Not everyone was happy with the militants, but if someone tried to escape, ISKP militants usually went after them to punish or kill them. Despite that danger, and the promises of heaven and glorious rewards from God, the father and sons said the atrocities became too much for them to handle. Khan described a growing sense of alienation from the group, which he started seeing as foreigners oppressing his countrymen. “These men from TTP (Pakistani Taliban) started working here as IS. They started taking land and trees from the locals as spoils of war,” he said. “They used to kidnap Afghanis to get ransom,” he added. Eventually, Khan decided to take his sons, and some other men under his command, and escape to a government controlled area. They surrendered to local police. He now works with the police. “Even now, if IS finds out we are here, they will find us and kill us,” Ali said. Meanwhile, they have no idea of the fate of dozens of other child soldiers who were living with ISKP. According to a Human Rights Watch report, the Taliban have also trained and deployed scores of children for military operations and used them to plant homemade bombs. The United Nations has documented the use of child soldiers by Afghan police. In December last year, the Afghan government signed an initiative called the Child Protection Policy, with the aim of protecting children in conflict zones, including barring its security forces from using children in armed conflict. But for children like Ali and Mohammad, there is no effective program to de-radicalize and re-integrate them into society. Now, Bakht e Ali works as a security guard, while Lal Mohammad stays at home and has not joined school again.